How good is JRPG Arc Rise Fantasia for the Wii? Who cares? What really matters is how to replicate its hairstyles. Hairstyle stands among the most notable traditions within Japanese RPGs. Each character is partially defined by their choice in locks, from the strong and silent heroes to the bubbly and carefree sidekicks. More than just a fashion statement, everything from the choice in cut and color, to the myriad accessories worn, there's a defining sense of self with each flashy hairdo! In Arc Rise Fantasia, players meet a world of characters with different views, passions, and goals, each with their quintessentially JRPG hairstyles! Explore this handy guide to create your very own Arc Rise Fantasia hairstyles this summer. 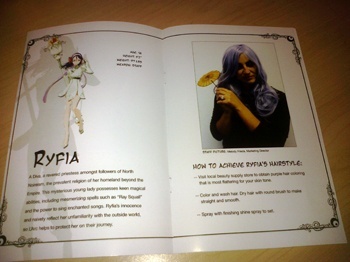 On the pages that follow, the game character is set on one page with a picture of the "real life" interpretation of the appropriate hair style and directions on how to achieve it gracing the facing page. The directions tend to be a bit on the vague side, such as "toss head a few times" or "tousle hair as a model would" and I'm not sure there is a color of purple that's "most flattering for your skin tone," but you have to admire how committed the guide is to seeing its wonderfully ridiculous premise through.